Summer is filled with so many happy things like weekend getaways, poolside relaxation, and time spent outdoors - all of which are made better when oil-infused of course. 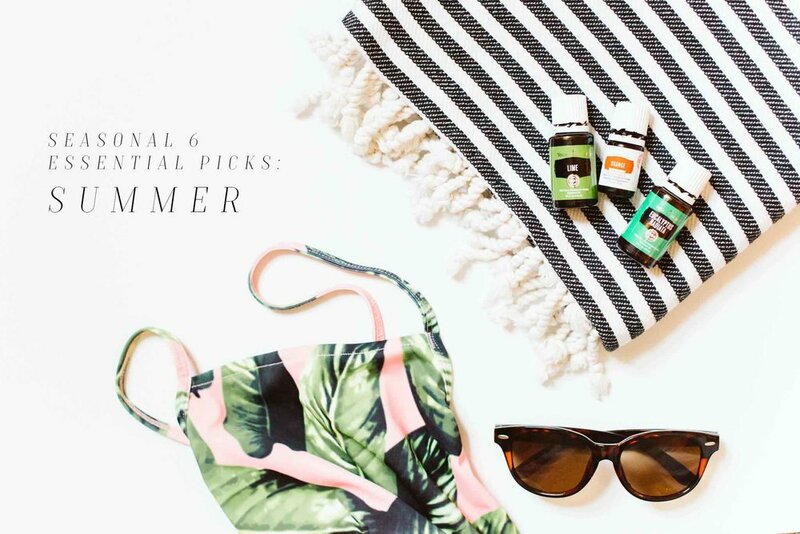 That said, I'm excited to start a new quarterly series: "Seasonal 6: Essential Picks for the Season", featuring six of some of my (many) favorite Essential Oils with a corresponding Diffuser Recipe Blend for you to try that mixes well with Starter Kit oils like Thieves, Peppermint, and of course Lavender. These blends will provide the healing, cleansing, and calming vibes you're going for this summer, all while supporting a toxin-free health and wellness lifestyle for yourself and your family. Important Note: As I always say, since there are no government regulations on Essential Oils and because I'm in business with Young Living, I can not legally go into further detail about each oil. To protect this incredible company and their farms, practices, and EO's, I can only discuss their scent and in what kind of situation I'd use them. I am not able to make any claims about the health and healing properties of these oils are capable of. To further your research, I encourage you to Google "benefits of: ____ oil" and see what you find! 1. CITRONELLA - Most of us are familiar with the fresh and grassy notes of this familiar scent. We often burn Citronella candles when we're enjoying time outside with family, picking crabs, sitting by the pool, or enjoying an ice cream cone (dairy-free for me, please) on the porch swing as the lightning bugs come out at dusk. But those candles are typically made with all artificial fragrances and don't work as well as we'd like them to. Plus, the reality is that candles do more harm than good for our respiratory systems and internal health of our bodies. Studies have shown that the fumes from candle-burning can be just as bad for us as cigarettes, releasing carcinogens, chemicals, and other toxins raising the risk of asthma and even cancer. (If you do wish to burn candles, it's best to burn ones made of pure beeswax.) So set your diffuser outside or make a spray or lotion with some Citronella oil instead! It's an 100% pure and organic alternative without the harmful additives. To make the spray, mix 4 oz. of water with 15-20 drops of Citronella oil, and a pinch of salt to bind the two together - since oil and water don't mix.) Shake to combine and spritz directly onto your skin. 2. LEMONGRASS - All of the citrus oils have highly emotionally uplifting properties. While you're on a long drive to your vacation destination, this is a great oil to diffuse in the car to keep everyone from getting as crabby as they may otherwise. Yes, there are diffusers for your car - just head over to Amazon. Make sure you buy the kind where you add water, not just put a drop on the little absorbent pads. I've noticed that they don't work as well. This is a wonderful oil to blend with Citrus Fresh and Peppermint (both of which do come in the SK). Peppermint is great for focus and keeping us more alert. Lemongrass also works as a non-toxic nail polish remover! It works like a charm, all while nurturing your cuticles at the same time - just used it today. 3. EUCALYPTUS - When we're so busy this time of year with kids going away to camp, friends' houses, needing a vacation after getting back from vacation etc., and with all of the craziness, it's easy for our immune systems to take a bit of a dive. Every now and again, my respiratory system will give me several symptoms as to why it's not happy, so I use a bit of Eucalyptus (which goes along way), and it always gives me healthy support when I need it most, especially when I diffuse it by my bed while I'm sleeping. Think "Vick's Vapor Rub", only natural... It's also a great oil to spray on your counter tops, bathroom sinks, door knobs, and wherever else all of your cookout or pool party guests have placed their fingertips with who-knows-what on them. 4. ORANGE - I looooove Orange oil. It's a confidence booster, mood uplifter, and tastes delicious with consumed from the Vitality line in recipes, smoothies, pies, cakes, yogurt, marinades, beer, sangria... the list is endless. Orange is an oil I use almost daily. I love blending it with Lime and Eucalyptus, which has been my "first day of summer" blend in the diffusers all day today. This is great to make a roller out of if you or your kids are feeling crabby after a busy week or just need a little "pick me up". It's also a good one to diffuse in the bedroom in the evenings if you and your significant other wanna have a little "you time" ;) See the recipe below. Roll this on your kids with a little Lavender if they're grumpy, or diffuse it in their play rooms with Thieves when they have friends over for a happy and immune-supporting blend. 5. ROMAN CHAMOMILE - This calming oil is wonderfully supportive of our bone and heart health, and is a natural skin-supporting oil when you've just come in from a long day out in the sun. I also like to add this to any salt scrubs, lotions, salt sprays, or toners I make for my skin. It has a light scent, just like Camomile tea but a little stronger since it's an oil with more concentration than tea. Blend a couple drops of this oil along with a drop of Lavender and some natural Aloe or Shea Butter and apply it to your skin for a soothing moisturizing affect. 6. TEA TREE - Most of us have heard about how incredibly useful this oil is. It's like Lavender in the sense that when you're in doubt - try a little Tea Tree. It's cleansing scent and supportive properties make it an addicting oil to use if you like a clean and fresh-smelling home. It's also wonderful to add into a little spritz for your skin with as a natural toner. I use a couple drops in my spot-treatment roller when my skin is having some issues. This is another oil you'll want to research - it's awesome.